I’m Paul Sokol and I’ve known these Novak guys for many years. Recently, Jordan has been writing a lot about data and wanted to do a post on the top 5 reports available inside Infusionsoft. The reason he asked me is because I’m pretty familiar with Infusionsoft and its native reporting functionality (been using the software since ’08). This was actually a really fun guest post because it forced me to take the entire lens of a small business and condense it to what I consider the most critical and insightful reports/data points. Oh! One important thing to note: this intentionally doesn’t have ANY campaign reporting in it. That’s a topic for an entirely different guest post. Alright enough flapping my digital gums, let’s get to these top five reports. This is one of the most important reports because it empowers a lot of crucial data points for the Product, Sales and Financial functions of your business. From a Chief Product Officer standpoint, this report gives a high level breakdown of what specific Offers are actually selling which indicates the general health of their Product Line. If a business has 20 things to sell, but only 3 are being sold, that means something different than if 18 of 20 are being sold. Neither circumstance is bad (nor good) without additional context but this report empowers that kind of “troubleshooting” into your Product Line health. From a Chief Sales Officer standpoint, this report shows how well you are doing you job, to be blunt about it. You can easily ascertain how many raw orders/sales came in and total volume sold per Offer. Again, great for “troubleshooting” the Sales process. Lastly, from a Financial standpoint, this is a highly valuable report because it shows what Offers are driving the Revenue. 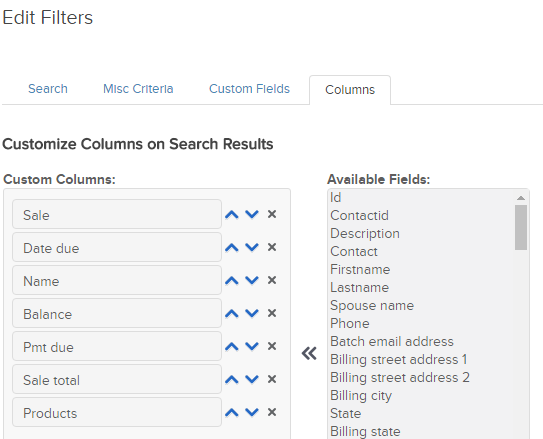 You can also filter to see which Referral Partners are driving sales. Lastly, you are also able to filter the report by refunds and write-offs too which means you can see what Offers are experiencing those kinds of transactions. Knowing what is refunding/being written-off can also be an important data point for both the Chief Product and Sales Offers! Please be aware this report doesn’t factor in any discounts so you cannot use it for your Accounting cycles. In other words, if you sold one thing for $97 but gave $20 off, this report will still show $97 as the amount sold. Despite this gotcha there isn’t a better report, IMHO, that gives you a better pulse on the heartbeat of a business than this one. Since you can only pull this report by date range, I recommend setting it for the current full month so you can save it and then get month-to-date stats (MTD) on your dashboard using a Custom Statistics widget. Then, you build an Operational habit to manually update the date ranges and re-save the report at the beginning of each month to keep your dashboard up-to-date. You can also setup a year-to-date version of this report as well if you want to keep track over the whole year. Typically, I won’t filter by any referral partner or refund status (found under Misc Criteria) to keep it a general report. You can also do on-the-fly filtering to pull the data you need, when you need it, once the report has been saved. 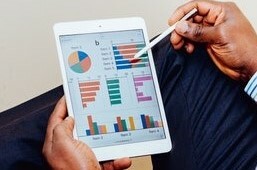 This is one of the best reports for the Marketing function of your business. If you use internal forms this will also give you insight into your Operations performance. From a Marketing standpoint, you are able to easily see how many new contacts have been added to the system. This is how you can track the general database growth. You are also able to see how many unique submissions a form received and the repeat submissions. 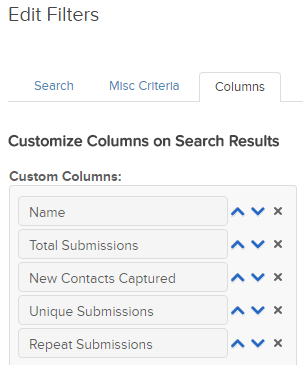 If you see a lot of unique submissions but few new contacts, that just means the existing database is heavily interacting. Depending on your goals, that may be a problem. Repeat submissions are either a good thing or a bad thing depending on context. Marketing wise, it may mean that something is broken as there aren’t too many real-world cases where someone fills out the same form multiple times. Operations wise, that might actually be expected. You may have a single internal form for workflow that gets filled out multiple times. Like the previous report, this gives you high level insight into the pulse of your Marketing and Operations. Its a great place to start troubleshooting if things seem to be off! Similar to the above report, you’ll want to do a MTD saved report that gets updated every month. There is also no need to do any specific filter either. Just a date range search and go! I’m always filled with apprehension when running this report for the first time with a new private client. Either they are on top of their books and don’t have a lot to collect OR they didn’t even know payments were failing and they are missing out on money they already earned. In some cases, there are failed orders from years ago so that money isn’t coming. Ever. That’s why the Receivables report is the next in line for this post. Basically, if someone owes you money they show up on this report and you know you have to do some legwork to recover the payment. The beautiful thing about this report is that it also works with payment plans, so unless a payment is truly overdue, it won’t show up here. Like the other two reports, you only need to filter by date range with no other criteria selected. The difference is you want to make the date range between far in the past (before you started recording Orders) and then through to 2099. This way, you only need to setup one saved report ever since the date range covers “all of time” from Infusionsoft’s point of view. The magic here is the data columns you want to use because you can easily overload the displayed information and make this report chaotic and useless. I’ll admit, I never saw the true power of this report until recently. How many different things can create a task or a note? Heck, how many manual WAYS in the system can you create a task or a note? There are even more ways to have a task or note created automatically, including built-in system stuff. Here’s what you need to understand: from a database standpoint, Infusionsoft has tasks and notes on (basically) the same database table. Its a leftover impact from their early architecture. Which is an advantage to us in this report. Realize that, data-wise a note and task are interchangeable (a task-note) and this is how you can unlock the true power of Infusionsoft and this report. A task-note has a Title which is searchable using this report. This means that you can report on nearly anything you want using intentionally structured task-note titles. For example, let’s say you want to see how many people went to the unengaged marketable status in a certain time frame. Using the email status automation triggers, you can have the system automatically apply a note with the title “Email Status Change – Unengaged Marketable”. Now, using this report, you can search for notes with that exact title. 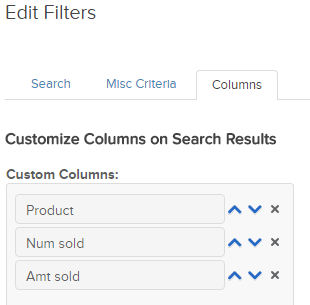 And since you can filter by date range, user and all sorts of other stuff, you can slice and dice that unengaged marketable data for the insight you need. Its becoming my “Swiss Army Knife” for reporting when private clients need a certain stat, especially campaign stuff. What about tasks? Its the same principle. Let’s say you are automatically creating tasks to call people when their email hard bounces. Those task titles can have a specific name which you can then report on, something like “List Engagement – Hard Bounce Call”. Remember to mindfully create your Note and Task titles inside your Campaigns, and you’ll get an extra layer of reporting out of it! How might you use this? For an Operational example, you could add a custom Decimal and Dropdown field for the class of work. Each time a task is completed, the User is trained to also update the hours logged and the kind of work they did (Marketing, Operations, People, etc.). Now, you can pull reports of how many hours are logged for each User which is segmentable by class of work. This is actually how I personally pull the labor to track my Revenue per Logged-Hour business metric. Oh yeah, I also forgot I guess you could also use this report to dig into the actual Tasks your Users are performing as well. What’s complete/incomplete, when was it done, whats overdue, etc. that kind of Operational management stuff. I can’t tell you the answer because this report is SO ROBUST! That’s like telling you how to fold a piece of paper. It all depends on what you are trying to do. 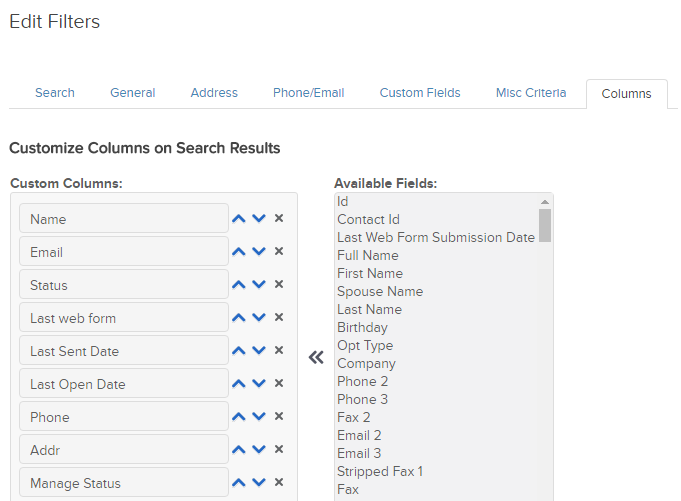 Make sure you only show the relevant data fields to keep you focused on whatever you need the report for. This little guy is your list hygiene power tool because you can search for people based on their email statuses. Looking for all your hard bounces? This does it. What about your confirmed folks? Yup! You can also segment by pretty much everything available in a Contact search too. This means you can now look at email engagement within certain cohorts of your database. Curious to see how your customers for a specific product in a certain state are behaving? You can get super deep answers like that using this report. You are also empowered to find people who are considered “cold” which means their email will be throttled the next time you attempt to send. This is really good information to have especially if you are doing any kind of a launch to your list. The last thing you want is to hit “Go” and emails slowly drip out because the list wasn’t warmed up. Using this report, you can be proactive and get ahead of throttling issues (or at least work to mitigate them). While this report is super robust, I actually recommend using the following fields because they empower whomever to “work” the list in whatever way they need. Even if you aren’t doing outbound stuff, being able to see if phone numbers or addresses are present can guide your strategy. Leave a comment and let me know what you thought! Do you need advanced reporting beyond what Infusionsoft or a even 3rd party tool can provide? Learn more about our Data Warehouse which gives you mySQL access to Infusionsoft data via backup that is refreshed every 15 mins. Literally plug into any reporting platform you want to use, unrestricted!